This weekend we had our first snow of the season. During the night Saturday, it started snowing and although it melted during the day Sunday, it was a “wake up call” Sunday morning, with all the snow covered trees, that winter isn’t that far off here in the North Maine Woods. Thank goodness I finished cleaning out the garden beds and essentially putting the garden to “bed” for the year on Friday. I also finished up my produce canning for the year Saturday afternoon. There were 2 large zucchini left and I decided to make them into bread & butter pickles. In preparation, I cut them in half lengthwise and scooped out all the seeds and membrane from the center. I took the halves and cut them in half lengthwise again (each was now a ¼ lengthwise piece of zucchini). These I cut into ¼ inch thick slices. I was ready to make Bread &amp; Butter Zucchini Pickles. Cover zucchini and onion slices with 1 inch of water and salt. Let stand 2 hours and drain thoroughly. Combine vinegar, sugar and spices. Bring to a boil. Add zucchini and onions. Simmer 5 minutes and fill sterilized canning jars with mixture and pickling solution leaving 1/2 inch space at the top. Wipe jar rims clean and cover with sterilized lids. Screw on bands and hand tighten. Process in a boiling water bath 15 minutes. Remove from canner and let cool. Check lids for proper sealing. Let pickles set for at least 6 weeks before eating for maximum flavor. Zucchini pickles! I feel like my mind is blown. We haven’t planted any zucchini yet, but our cukes are starting to grow. I can’t wait to try this recipe. 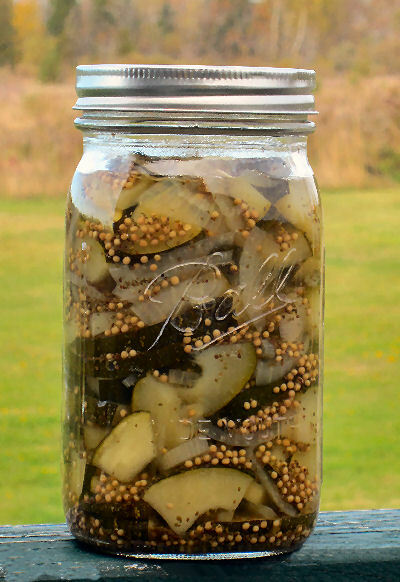 It never entered my mind to make pickles with zucchini but now it sounds like delicious! I’ve never even made pickles before buy may have to give it a try! Thanks so much for sharing at Share The Wealth Sunday! Thanks for sharing with us at Merry Monday. I love bread and butter pickles but I’ve never tried making them with zucchini. Great idea! 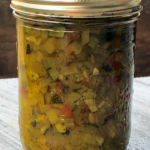 Cukes and I don’t get along well so I’ve been making zuke pickles and they’re great! I wanted to pass along a suggestion for making neat, pretty slices/chunks – quarter the zukes lengthwise and lay a quarter on your cutting board pointing away from you. Laying your knife (pointing away from you) at about a 45 degree angle, slice off the spongy middle part, creating a long skinny piece that is triangular in cross-section. Chuck that in the compost, it’s not really even good for zucchini bread. Repeat with the other quarter-zukes. Then gather the sticks together and chop crosswise into slices or chunks. It goes a LOT faster than the scoopy business, and you can adapt it for making pickle spears too. Also, I don’t work for Ball and I get no compensation, but I wanted to rave about a product called “Pickle Crisp” for zuke pickles, since they are terribly prone to getting soft in the processing. They really do end up crunchy, like cucumber pickles that have been through all that lime-soaking business (what a pain) or fridge pickles. I just went out and BOUGHT more zucchini – not kidding – to make more bread & butter pickles because they’re getting eaten up so quickly! Great information! Thanks for posting it. I’ll be trying your tips. Sounds like you like “getting pickled” as much as I do. Canning is such a satisfying endeavor. I love looking at my shelves all filled with canned produce, truly a thing of beauty. I LOVE bread and butter pickles but never thought about using zucchini for them. Love it! Thanks for linking up at NOH. If you get a chance, I’d love a link back on your posts also. We had such a crazy spring and dry summer that our cukes didn’t do that well but as usual I had tons of zucchini. I had made relish out of them in the past but you only need so much relish LOL. So I started pickling them. They are the same texture as cukes so I thought it would work and it did! Any pickle recipe can work with zucchini! My husband’s grandma used to make these for us. I will have to give it a try. oooh yum. a great way to use up so many zucchinis, my mum usually does this kind of stuff. I’m hoping for too many this year, and I may have to do this, my hubby loves the stuff. Beautiful!! Thank you so much for sharing your awesome recipe with Full Plate Thursday. Hope you have a great weekend and come back soon! How interesting with the zucchini! My mom cans pickles, and they are always so good. This sounds great! Thanks for sharing at MTM! something about a snowy evening/day makes me want to work in the kitchen. i’ve been wanting to try to make my own pickles! we won’t see snow for a while still here in virginia, but the temps are definitely getting chilly-er! Yum these sound delicious! I’ll have to make some. 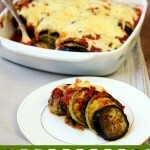 It’s a great way to use up the always prolific zucchini!